The Sony Xperia XZ1 first saw the light of day in August 2017, and a lot has happened since then – not least the launches of the Sony Xperia XZ2 and Sony Xperia XZ3 phones, which may well be a better buy for you than this is. Here are our our original thoughts on the Xperia XZ1, which might still be worth a look if you can find it at a decent price, even though there are now never models in the Sony line-up. At first glance, the Xperia XZ1 looks a lot like the Sony phones that came before it: Sony once again indulged its seemingly irrepressible passion for its omnibalance design, which has changed only in subtle ways over the last four years. Even when it first came out, we would have forgiven you for thinking the Xperia XZ1 was a couple of years old, such is its similarity to previous handsets like its immediate predecessor the Xperia XZ (2016), the Xperia Z5 (2015), and the Xperia Z3 (2014). The specs are more in line with a 2017 phone though, even if the design isn't: you get a Snapdragon 835 chipset, 4GB of RAM, a 19MP rear-facing camera, HDR support for the display and Android 8.0 Oreo on board. That said, in a year when Samsung, LG and Apple all went almost bezel-less with their phones, and HTC and OnePlus overhauled their design propositions, it's hard not to feel like Sony is slipping behind its rivals. Watch our video review of the Sony Xperia XZ1 below. 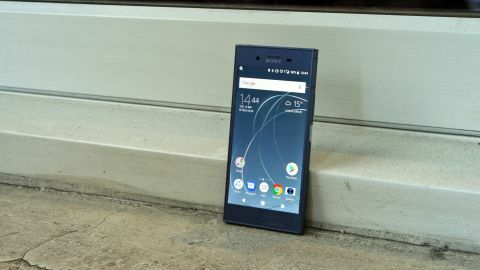 The Sony Xperia XZ1 was released on September 19, 2017 in the US and September 22 in the UK, followed by several other regions over the months. As for the Sony Xperia XZ1 price, it was originally set at £599 ($699.99, around AU$875) SIM-free at launch in the UK. Since then it has of course dropped – check out the widgets on this page for the latest deals. When it first arrived, the Xperia XZ1 was a touch more expensive than contemporaries including the LG G6, HTC U11 and iPhone 7, but came in cheaper than the Samsung Galaxy S8 and iPhone 8. The Xperia XZ1 was the successor to the Xperia XZ, and while Sony refined its flagship phone for a slicker, more impressive finish, the design didn't move on in a significant way here. It means the Sony Xperia XZ1 looks a little dated, especially next to the Samsung Galaxy S8 and LG G6 that were around at the time, and other phones that have launched since. To be fair the likes of the iPhone 8, the HTC U11 and the OnePlus 5 all still had sizeable bezels in 2017, but the industry was moving on. As we've mentioned though, Sony subtly refined its design once again. First off, the Xperia XZ1 is a touch thinner than its predecessor at 7.4 mm (down from 8.1 mm), and it boasts a metal unibody carved from a single piece of aluminum, giving it a strong yet surprisingly lightweight feel in the hand – an improvement over the XZ that came before it. There are three antenna breakout points on the handset, which appear as three slender bands on the sides of the device. Sony says these improve network connection no matter how you’re holding the phone; in short, there's less chance your hand will block all the antennas on the Xperia XZ1. These are minor improvements, as are the even more rounded edges, which make the XZ1 feel more secure in hand and easier to hold – although without the gently curving edges like you get on other phones, it's still a stretch to reach a finger across the screen. Around the sides you'll find the usual suspects – there's a SIM and microSD tray on the left, while on the right are the volume rocker, dedicated camera button and concave power button. Two notes on the buttons: first, the volume rocker has been shrunk, reducing the margin of error when you're adjusting the volume. It's a minor point, but we'd have liked a slightly longer key for a more natural input. Second – as it had before – Sony omitted the fingerprint sensor from the XZ1 in the US, while in other regions (including the UK) it's built into the easy-to-reach side-mounted power key. The SIM tray is also needlessly fiddly. First you have to remove the plastic cover, which slides out with a microSD tray attached to it. This makes swapping expandable storage in and out easy, but the SIM tray doesn't come attached. Instead you have to dig out a separate plastic tray with your fingernail. It's not easy, nor intuitive, and there's no reassuring click when you slide the tray in to tell you it's properly inserted. The plus point here is that you don't need a SIM tool to insert or remove the card, but we'd have liked the tray to be attached to the plastic cover like the microSD tray. In true Sony Mobile tradition the Xperia XZ1 is also IP65/68 certified, meaning it’s fully dust- and water-resistant, while also being able to survive a dunk in the wet stuff without frying itself. Around the XZ1’s top and bottom caps, the soft edges make way for the glossy, diamond-cut metal trim. The bottom plays host to the USB-C charging port, while you’ll find a 3.5mm headphone port on the top. Sony has packed dual front-facing speakers into the Xperia XZ1, and these feature its S-Force surround technology, providing 50% more sound pressure than the speakers on the XZ. This allows you to enjoy stereo surround sound while watching movies or playing games. We found the sound to be very good, and we much prefer the speaker placement over Samsung’s and Apple’s insistence on bottom-firing, single speakers which can be easily muffled by your hands. The Sony Xperia XZ1 is available in four colors: Black, Warm Silver, Horizon Blue and Venus Pink, although it’s currently not clear if all those hues will come to every region the handset is sold in. Finally on the design front, the back of the phone has received a tweak. The main camera sensor is located in the familiar place in the top-left corner, but the flash and laser have been relocated horizontally in the center of the handset. Overall the Sony Xperia XZ1 has a smart, premium design which could well be suited to business professionals, but there’s no getting away from the fact that it looks dated compared to its rivals. The display on the Sony Xperia XZ1 is another feature you wouldn’t expect to see on a flagship Android phone in 2017. What you get is a Gorilla Glass 5-covered 5.2-inch 1080p display. At this size the screen is sharp, text is easy to read and images are rendered with a high level of detail. However, for the same money – and in some cases less – you can nab a flagship smartphone with a QHD display from a rival, providing even more detail, color and punch direct to your eyeballs. Considering that Sony previously slapped a 4K display on the Xperia XZ Premium, it makes the decision to drop all the way back to 1080p on the XZ1 all the more puzzling. It’s not all bad news though, as Sony has added HDR support to the screen on the XZ1, which means you can enjoy bright, clearer and more impactful visuals from supported services including YouTube, Amazon Prime and Netflix. Videos with HDR support look impressive on the XZ1’s display, and it makes for an enjoyable viewing experience. The chunky bezels above and below the display are useful here too, as it gives you somewhere to rest your thumbs without covering any of the display.